Zucca, in Italian, means squash; zucchini, the diminutive, “small squash” (the Italians snap them off the mother vine at three-and-a-half inches). 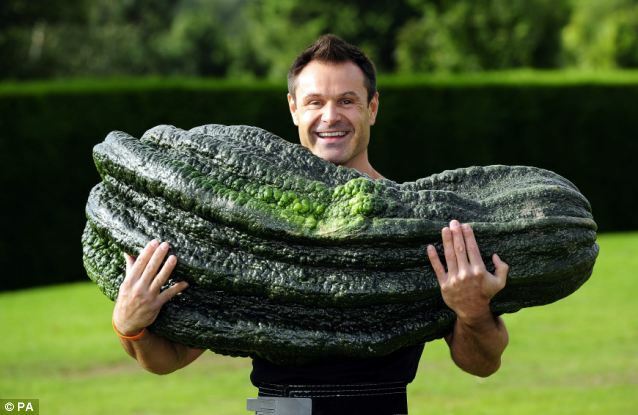 So why are zucchini so often the size of baseball bats? 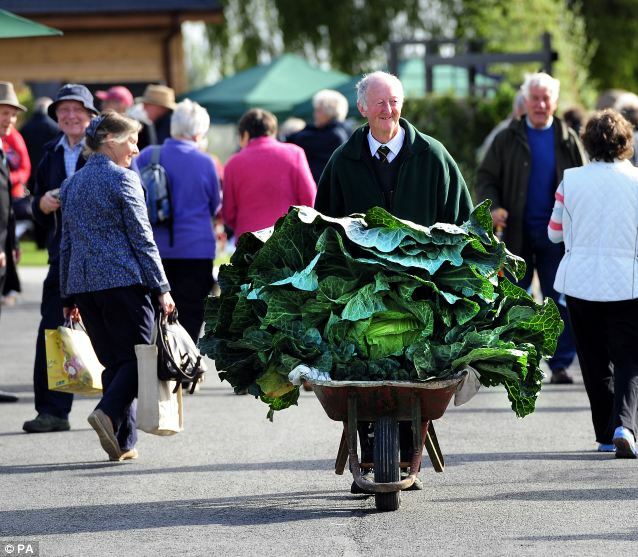 You’ll have to ask the British about that, who call them “marrows,” and win the world records for growing giant vegetables at the Great Yorkshire Showground every summer. 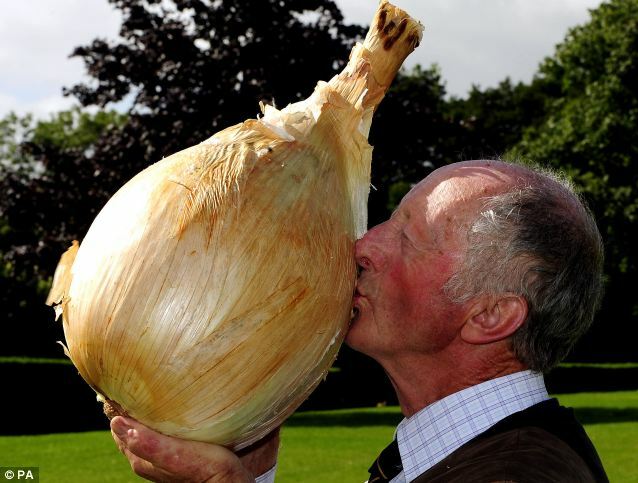 Proud farmer, Peter Glazebrook smashed his own record for the world’s largest onion. 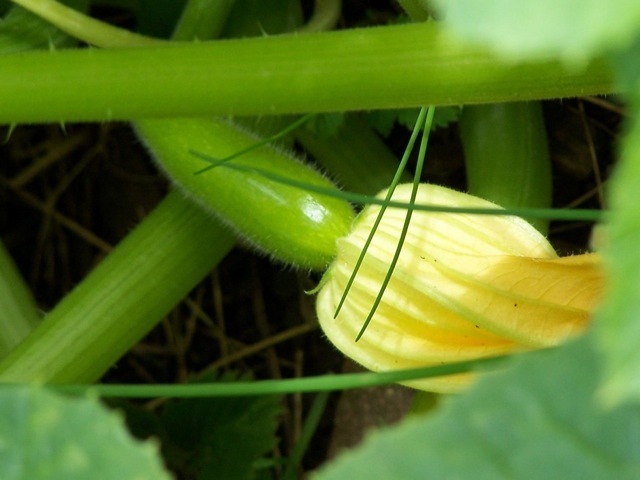 Story and photo: Daily Mail online, U.K. Photo copyright: PA.
To read about the long and short of it, and learn to look forward to a bumper baby zucchini crop every summer, go to my new article for Zester Daily. 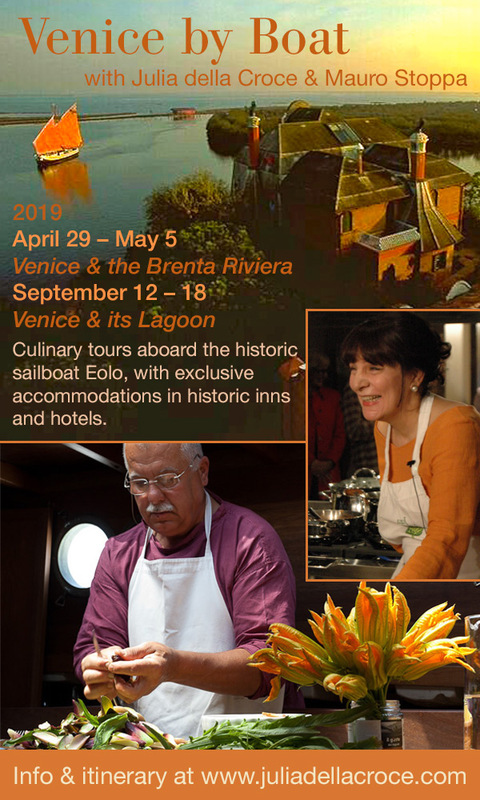 There you’ll find the whole story of America’s gift to Italy, and the recipe for the Italians’ return gift to America, these light and exquisite frittelle di zucchini, zucchini fritters. When you’ve tried that, here are seven more, from simplest to simple. All recipes presume very young, cylindrical zucchini and suppose sea salt and pepper to taste. “Olive oil” always denotes “extra-virgin.” Herbs should be fresh. Note: “Al dente” is for pasta, not vegetables–if you undercook zucchini, their sweetness and flavor won’t emerge. “Tender but not mushy” is the cue. Boiled (a revelation): Slip whole baby zucchini into boiling water (hold salting until serving); boil until tender (not crisp! ), 20-30 minutes, depending on size; drain–don’t chill. Serve whole, and season at this point salt and your best olive oil. Eat warm or cooled. Salad (delivers clean, virgin zucchini flavor): Cook and drain whole zucchini as for “Boiled.” Cut fruit in half lengthwise; allow to cool in colander; drain again. Season, and dress with your best olive oil and aged sherry or wine vinegar; scatter with chopped fresh herbs. One-stop braised zucchini and onion (my childhood favorite): Cut 2 lbs zucchini into 3/4-inch dice; combine in a heavy, cold pan with chopped large onion, 4 T butter or olive oil, basil or tarragon; cover and cook gently under tender, 15 minutes, stirring occasionally; season and cool down before serving. Charcoal-grilled (smoky way to concentrated natural zucchini flavors): Cut into 1/4-inch slices; coat with extra-virgin olive oil. Grill on both sides over hot ashes. Oven-roasted (caramelizes beautifully and sweet enough for dessert! ): Repeat preparation for “Grilled.” Roast in a preheated oven at 400° F to brown on both sides, flipping halfway through cooking. Season when hot; top with chopped fresh parsley. Breaded and pan-fried zucchini (addictive): Cut into lengthwise 1/8-inch slices. Season and dredge in flour; dip into beaten egg, deep-fry in hot safflower oil. Drain on paper towels; salt when very hot to make it stick. Simple Batter-Fried (irresistible): Cut as for grilling. Make batter with 1 c seltzer and 2/3 c flour. Dip zucchini slices into batter; deep-fry in hot safflower oil. Drain on paper towels, salt when still very hot so it will stick. Those fritters look amazing Julia…I will have to make some with my next “harvest”. Made a kind zucchini parmigiano recently, you know how it is when you are growing them! And of course batter-fried is almost my favourite (the blossoms are #1). Thinking about a sort of gratin too! Love the photo of the guy with the onion! Grazie mille! Yes, don’t forget those blossoms! Your recipe is the closest I ever got to my grandfather’s – & with the sage leaves… Addictive! Thank you! Do tell me what you remember of your grandfather’s. Where was he from? And the blossoms, the blossoms… yes, of course… that will be another post. The fritters are beautiful! The thing that ALWAYS surprises me about zucchini is I walk out one morning and look at them on the vine, and they are tiny. When I go out the very next day I see that at least one has grown to Zucchinizilla proportions. It gets me every time. They are sneaking little darlings, aren’t they? As with most things culinary I lean heavily toward the Italian over the English (except perhaps for Stilton soup and a rib roast). 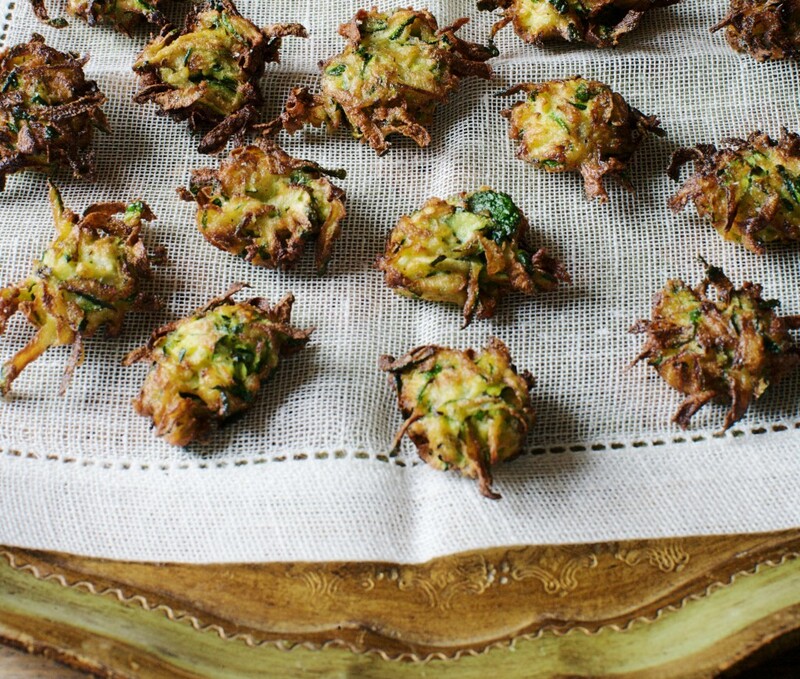 I am particularly looking forward to trying out those zucchini fritters! They look irresistible! Never had Fritelle di Zucchini but there is always a first time. I’ll have to let Bill Marsano “pour with pleasure” my favorite amarone with it. I had Zuppa di Zucchini at AI FIORE and it was to die for. But wait, I still haven’t done the “Stracotto” you said I can easily serve without much a do.! You’re holding out on my, Juliet. You need to tell me what was in the the zuppa di zucchine al fire-and where you had it!